On the outside, Google's Pixel phones look an awful lot like Apple's flagship. But what about on the inside? 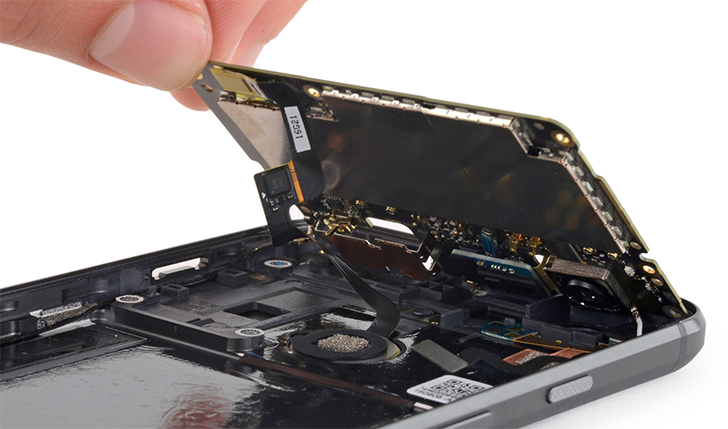 iFixit has a hallowed tradition of taking apart every new major smartphone (and other tech products), and determining how repairable it is. iFixit has posted their teardown of the Google Pixel XL, and there are some small surprises. In their attempt to free the display from the phone's assembly, the OLED panel separated from the glass "a little too easily for our liking." This resulted in a broken OLED panel, and no doubt is a sign the Pixel is a bit hard to dig into. Below the display rests a midframe, separating the rest of the device from the screen. iFixit remarked about how modular the phone's components are; the Type-C port, camera, and headphone jack are all easily replaceable. The motherboard contains Samsung-made RAM and UFS 2.0 storage, the Qualcomm 821 CPU, more Qualcomm chips for power management/audio/LTE, and other minor components. Perhaps the most surprising part of this teardown is that HTC's branding is only present on the battery. Overall, iFixit gave the Pixel XL a repairability score of 6/10. They noted that while many of the components are easily-replaced, opening the phone at all is difficult without damaging it. As always, the best part of iFixit's teardowns are the pictures, so go visit the source link for all the details and images.